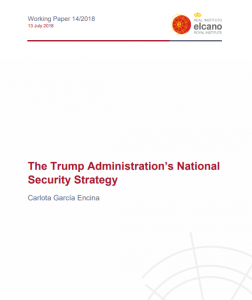 At the end of 2017 the US published a new National Security Strategy (NSS), replacing the previous NSS of 2015 in record time. (4) to promote US influence in the world. Th structure of this working paper is based on these same four pillars, but it also analyses the three broad categories of threats facing the US –at once military, political and increasingly economic– in the context of this geopolitical competition. China and Russia –characterised as revisionist powers that challenge the power, influence and interests of the US by attempting to erode its prosperity and security– comprise the first group. In the second group are the ‘rogue regimes’ –North Korea and Iran– that pursue the possession of weapons of mass destruction, support terrorism and destabilise. Finally, there is another group that includes transnational and other criminal threats, along with terrorism. Significantly, after more than a decade and a half, the fight against terrorism is no longer the top priority of US national security.